:: To all of you lgbtq folk listening in the Fargo-Moorhead Area, please take a look at this opportunity to receive services in November by following Harbor Health Clinic on Facebook. 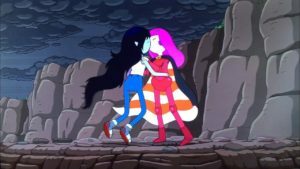 :: Next, congratulations to Adventure Time on its completion of the series, and the canonization and full explicit confirmation for Princess Bubblegum and Marceline kissing on screen and returning to being in a relationship. :: QUEER FANDOM Cont. Gonna go over some queer fandom stuff some more, talk about au’s, headcanons and canon. Toxic Fandom: When Criticism and Entitlement Go Too Far | via Geekdad by Sean Z. Do you want updates on how Finding Me Programs are built along with Nemo’s art? Become a Patron below!